Preheat the oven to 400 degrees F. Peel and chop the butternut squash into small bite-sized pieces. Place on a large sheet pan and toss with olive oil, salt and pepper (to taste; I add about 1 teaspoon salt and 1/2 teaspoon pepper). Toss the squash and put in an even layer on the tray. Bake for 15 minutes then remove from oven and toss. Return to oven and bake for an additional 10-15 minutes longer or until tender. Set aside and allow to cool for a bit before adding to salad. Cook the pizza at the same oven temperature! Meanwhile, prepare the rest of the salad: add the spinach to a large bowl. 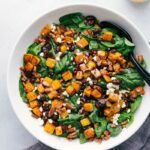 Top with coarsely chopped pecans, dried cranberries, and feta or goat cheese. Prepare the dressing by combining all of the dressing ingredients (season with salt and pepper to taste; I use about 1/2 teaspoon each) in a mason jar. Place the lid on the jar and shake to combine. Add cooled squash to salad, toss with dressing, and enjoy. This salad doesn't sit well with the dressing, so only dress what will be enjoyed same day. Store any leftover salad and dressing separately.